Eric Lindstrom is Physical Oceanography Program Scientist at NASA Headquarters. For the last 20 years, his primary job has been supporting NASA satellite missions related to measuring physical characteristics of the ocean (principally, temperature, salinity, sea level, and winds) and supporting the oceanographers that generate knowledge from such data. 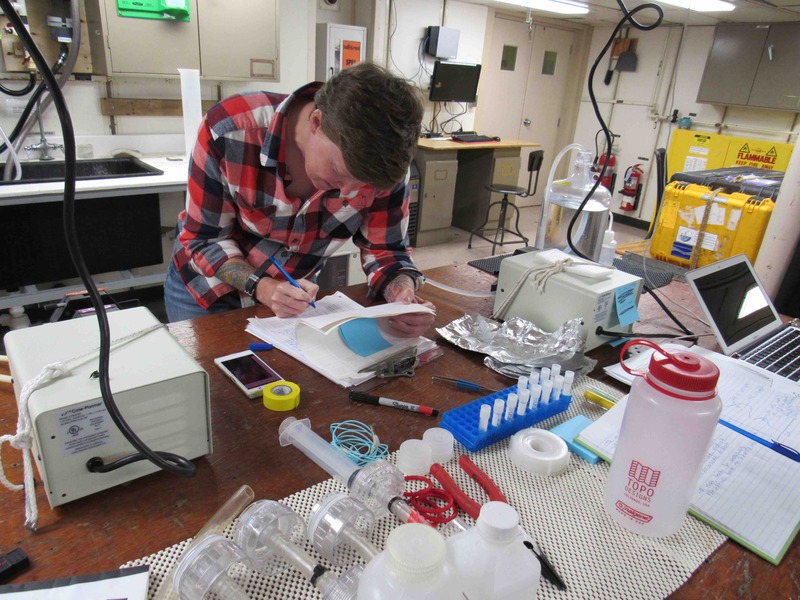 He was recently aboard the Research Vessel (R/V) Roger Revelle in the Pacific Ocean as part of the Salinity Processes in the Upper Ocean Regional Study-2 (SPURS-2) field campaign. SPURS is undertaking oceanographic field experiments to further understand the essential role of the ocean in the global water cycle using a plethora of oceanographic equipment and technology, including salinity-sensing satellites, research cruises, floats, drifters, autonomous gliders and moorings. What lives below us? This is a question that mariners have wondered for ages. We no longer think of the darker answers to this question—the sea monsters, the Kraken, the great whales. For most aboard, the thinking is akin to a fisherman’s—tuna, mahimahi, sharks. But for SPURS-2, Sophie Clayton is answering this question in terms of microscopic life, namely diverse phytoplankton (plant life) and zooplankton (animal life). Sophie is an oceanographer interested in understanding how ocean currents at all scales shape the distribution and biodiversity of phytoplankton. She uses a combination of numerical models, large-scale data analysis, and targeted observations made at sea. Her Ph.D. in Physical Oceanography from the Massachusetts Institute of Technology/Woods Hole Oceanographic Institution Joint Program. Now she is a postdoctoral fellow at the University of Washington, working extensively with observations of phytoplankton distributions made using an Imaging FlowCytobot (IFCB) that analyzes discrete samples with video and a hyperspectral optical sensor for recording the continuous optical properties of the water. An IFCB is an instrument that is used primarily to count cells, but it also can detect and record information on different properties of the cells that it counts. A water sample is channeled into a thin stream that is passed in front of a laser, and the scatter and fluorescence from each cell that passes along the stream is detected and recorded. In the IFCB, the camera is triggered to take a picture only when fluorescence over a threshold value is detected. This means that the instrument only takes pictures of cells that contain chlorophyll. The images are then stored for analysis back on shore. In addition to the images that are collected, we use the optical properties of the cells (fluorescence and scatter) in the analysis. 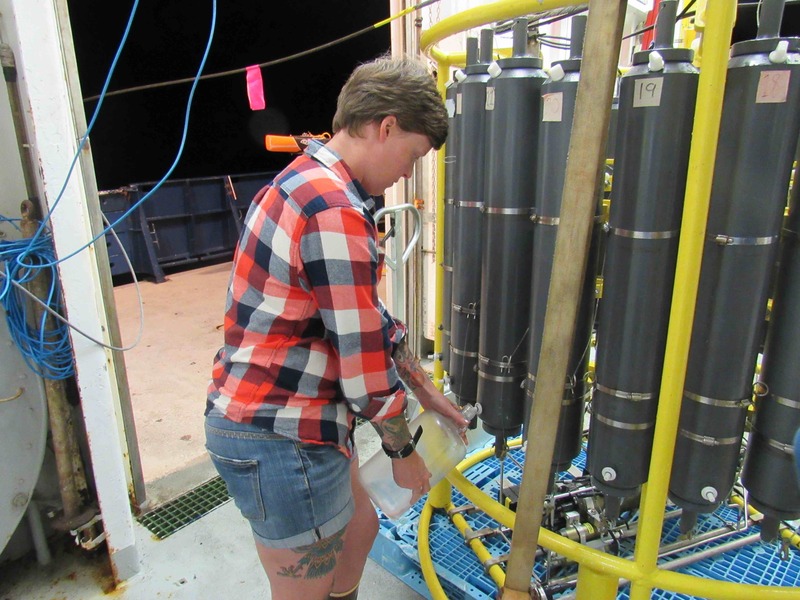 Sophie’s work is enabled by surface water collected from the salinity snake while we are underway or from bottle samples taken during Conductivity- Temperature-Depth (CTD) casts. Similar mosaics are made from surface water every 20 minutes. Overall, there will be close to 2,000 mosaics of cellular life to examine. Samples are also held for later DNA analysis. Out here, for the most part, the plankton are actually most abundant below the surface at 40-70 meters depth. Deeper down, below the surface layer mixed by the wind, life has better access to the chemical nutrients of the deep sea while still having enough light for photosynthesis. Plant life thrives in a layer that best balances the light and nutrient requirements. Of course, the grazing microscopic animals follow this layer closely. So Sophie is keen to collect water from this layer during our CTD casts. She can tell where to sample by optical properties also measured on CTD casts. 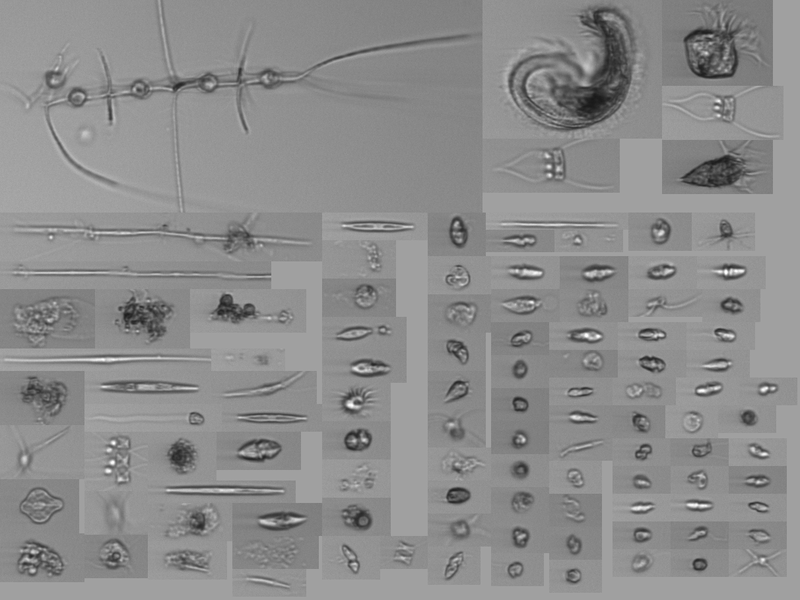 Understanding plankton abundance and diversity is a core requirement for ocean climate science. Phytoplankton are responsible for about half of all photosynthetic production on the planet. (Land plants are also responsible for about half.) It makes them a key part of the carbon cycle on the planet. Over long periods, phytoplankton can remove carbon from the upper ocean and return it to sediment for long-term sequestration. Over hundreds of thousands of years, phytoplankton act to reverse the greenhouse effect caused by pulses of carbon dioxide injected into the atmosphere by volcanoes or humans. In a prior blog, I wondered about the fate of life in the sea. What would become of that abundant life with the continued impacts of ocean acidification, industrial fishing, and plastics pollution? Science struggles to make any predictions. Oceanographers particularly, because of our close affinity and observation of the sea, hope that the assaults of society on the sea do not damage its inherent ability to stabilize and heal the rapid changes overtaking the planet. Our baseline understanding of the complex marine ecosystem is still quite primitive. 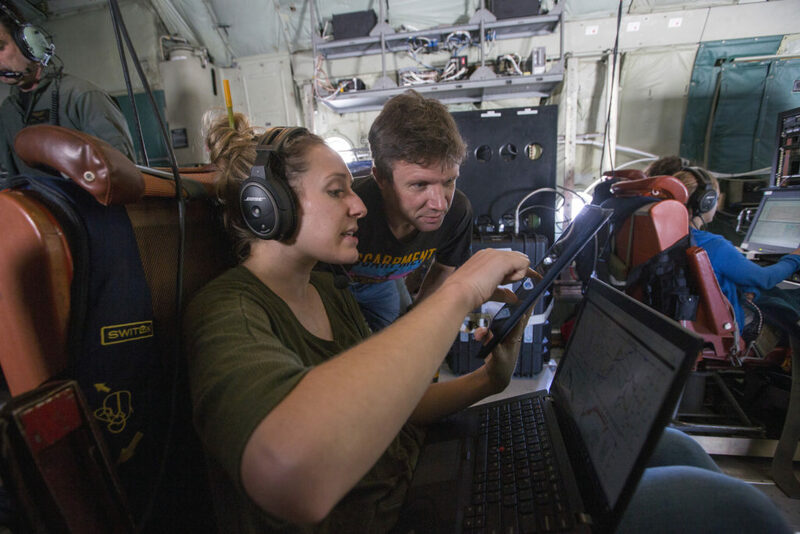 The kind of “survey” work that Sophie is undertaking is absolutely necessary to further our understanding of the biogeography of the ocean and how it is changing. Let’s hope she has a successful career! Eric Lindstrom is Physical Oceanography Program Scientist at NASA Headquarters. 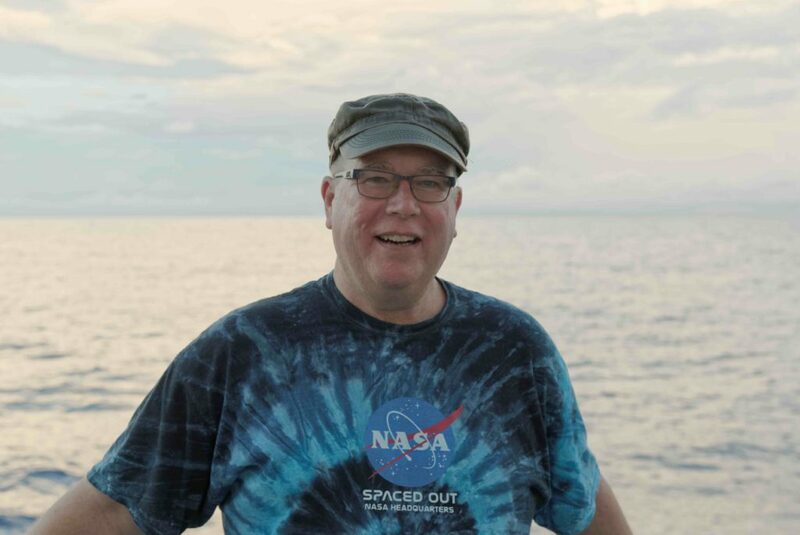 For the last 20 years, his primary job has been supporting NASA satellite missions related to measuring physical characteristics of the ocean (principally, temperature, salinity, sea level, and winds) and supporting the oceanographers that generate knowledge from such data. 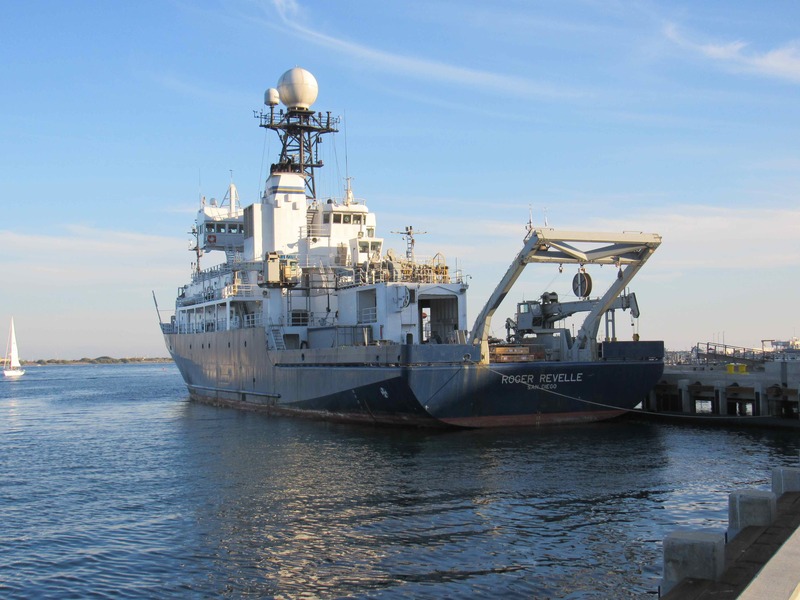 He is currently aboard the Research Vessel (R/V) Roger Revelle in the Pacific Ocean as part of the Salinity Processes in the Upper Ocean Regional Study-2 (SPURS-2) field campaign. SPURS is undertaking oceanographic field experiments to further understand the essential role of the ocean in the global water cycle using a plethora of oceanographic equipment and technology, including salinity-sensing satellites, research cruises, floats, drifters, autonomous gliders and moorings. You can read more about SPURS field campaign through Eric’s Notes from the Field blogs. In July 1969 I was watching Neil Armstrong take his first step on the moon at Tranquility Base, like everyone else with a TV at the time. I was at USC Wrigley Marine Center on Catalina Island as a 13-year-old visiting my brother, who was spending the summer studying there. If you had asked me then if I would wind up working for NASA, I would have said, “No, I’d rather pursue oceanography!” Well, since 1997 I have been the Physical Oceanography Program Scientist at NASA Headquarters AND I am a dedicated sea-going oceanographer. It stills feels kind of crazy what comes around in life. I write my short career biography here for students who may consider working in oceanography or for NASA or both. After graduating from Huntington Beach High School in California in 1973, I took the train across the country to begin my college career at the Massachusetts Institute of Technology. After only one semester of MIT physics and mathematics problem sets, this boy gravitated to the Department of Earth and Planetary Sciences and asked them how I would train to be an oceanographer. There were no undergraduate oceanography courses, so I was told to take physics and math (ouch!) and to get my degree in Earth Science I would have to take the required geology and geophysics courses, too. I did all that, but rocks were not my first love. Luckily, a Professor of Physical Oceanography at MIT, John Bennett, allowed me to work with him under MIT’s Undergraduate Research Opportunities Program (UROP) and sit in on his graduate level physical oceanography courses. We worked together on an analysis of the coastal boundary layer in Lake Ontario, and I co-authored a paper with him that appeared in the Journal of Physical Oceanography in the summer of 1977. UROP and that research paper were a big boost for my applications to graduate school. I still donate money annually to MIT’s UROP to honor its impact. For graduate school I sought out a diverse set of schools: UCSD Scripps Institution of Oceanography, University of Washington, Princeton, and University of Miami. I was told that since I was at MIT, I should NOT apply to the MIT/Woods Hole Oceanographic Institution joint program (that was weird). In the end I did have choices and settled at University of Washington working with Professor Bruce Taft. It was the era of Apollo-Soyuz and USA-USSR cooperation in space and oceanography, so I embarked on studying eddies in the North Atlantic with a diverse set of US and USSR scientists. The project was called POLYMODE. It was a fun project with time at sea and lots of workshops and meetings, including a month in Moscow doing a data exchange. The connection to the space program was remote and programmatic and I hardly noticed it at the time. I received my PhD in September 1983, the day the Australian’s won the America’s Cup sailing race. I celebrated, since I had signed up to move to Australia to do oceanography (and get married!) the very next month. Australia was a hoot! We moved to Hobart in Tasmania where the government was building a new marine science laboratory and eventually a new oceanographic research vessel as well. It was a growing field because 200-mile Exclusive Economic Zones had just been declared and Australia wanted to know all about the waters around the continent—good work for a newly minted oceanographer! The team in Hobart had me focus on the western tropical zone, including the Coral Sea, Solomon Sea, Bismarck Sea, and the circulation around Australia’s neighbor Papua New Guinea. Hardly anything was known so I worked with some of my buddies back in the USA on developing the Western Equatorial Pacific Ocean Circulation Study (WEPOCS). It was a great success! We named some new ocean currents and replaced some old stale ideas with some fresh perspective on the role of the western tropical Pacific in climate. While in Australia in the 1980s I also became involved in the planning of a huge international experiment – the World Ocean Circulation Experiment (WOCE). My work on WOCE had the Australian government send me back to the USA to work at Texas A&M University, the U.S. WOCE Office. That certainly began returning my roots to US soil. After returning to Australia it was not long until headhunters from USA sought my return to work again in the USA at the project office in Boulder, Colorado, of the Coupled Ocean Atmosphere Response Experiment (COARE; an experiment just off the coast of Papua New Guinea). The family decision was to make a return to the USA permanent. Boulder only lasted about 18 months and then I returned to WOCE work as U.S. WOCE Program Scientist in Washington, D.C., in 1992 as an employee of Texan A&M University but under the direction of five federal agencies (each providing 20 percent of my support). Gosh, the world is convoluted sometimes! That, for me, began “interagency cooperation” in oceanography for which I am still deeply involved. Broadly, the five agencies that fund global oceanography projects are the same now as they were then: NSF, NOAA, Navy, NASA, and Department of Energy. Eventually, after five years working on WOCE and the new Global Ocean Observing System, I got a call from Bruce Douglas at NASA Headquarters. He was serving a stint as Physical Oceanography Program Scientist and asked me to interview as his replacement. NASA told me they were looking for someone who could integrate their oceanography (from space) into the federal family of oceanography agencies. Certainly, I had experience for that. However, I told them I had no particular experience with satellite oceanography. 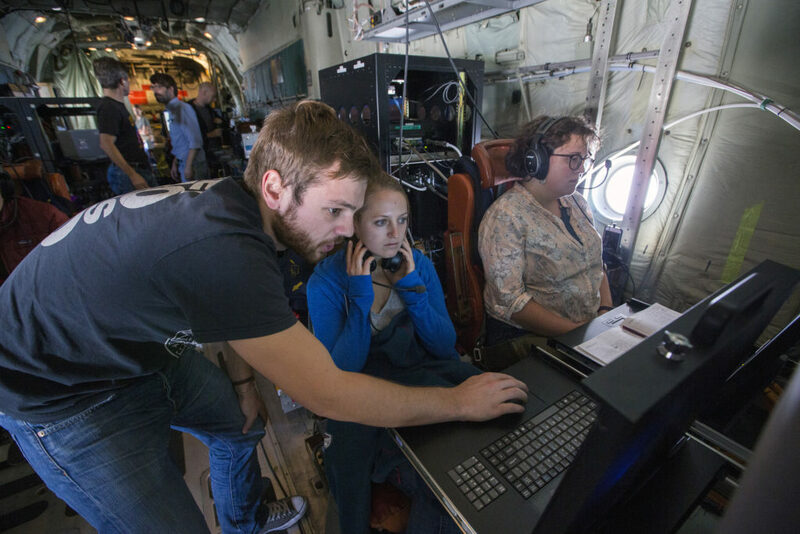 Their idea, and response at the time, was that they had plenty of satellite oceanographers at NASA but that it might be good for their leader to be someone who had “touched seawater” and was open to learning about the new tools for satellite oceanography. Wow, I said, you have found the right person! So, here we are, after 20 years, I have learned my fair share of satellite oceanography and have thoroughly enjoyed NASA. I have molded NASA Physical Oceanography into a community that fully supports its satellite missions with appropriate science at sea. I hope I have helped to make satellites an everyday tool for oceanographers. The positive feedback from the community has been most humbling. I am very lucky indeed to have landed on my own Tranquility Base. Fieldwork is my favorite part of my job. I have been working as a postdoc at NASA’s Langley Research Center in Hampton, Virginia, for a few days over a year, and I’m still not over the excitement of arriving somewhere new, ready to take measurements and run our instruments. My background is in chemistry, but I slid into meteorology because I wanted to apply myself to environmental issues that had global impact. That decision put me on a path into the world of air quality research, and ultimately to NASA to work with airborne science. While I’m still new to flying for science, I love working with instruments and taking measurements. Being on an aircraft turns that feeling up to 11. Atmospheric Carbon and Transport-America, or ACT-AMERICA, has been an especially cool project to be involved with because I earned my Ph.D. at Penn State, where principal investigator Ken Davis and other members of the ACT-AMERICA planning team are based. Working with ACT-AMERICA is part serious work and part fun reunion, working with people I know well on a totally new subject and project. I got to fly with the mission last spring, and I’ve come back to join them again for two weeks in Shreveport, Louisiana. 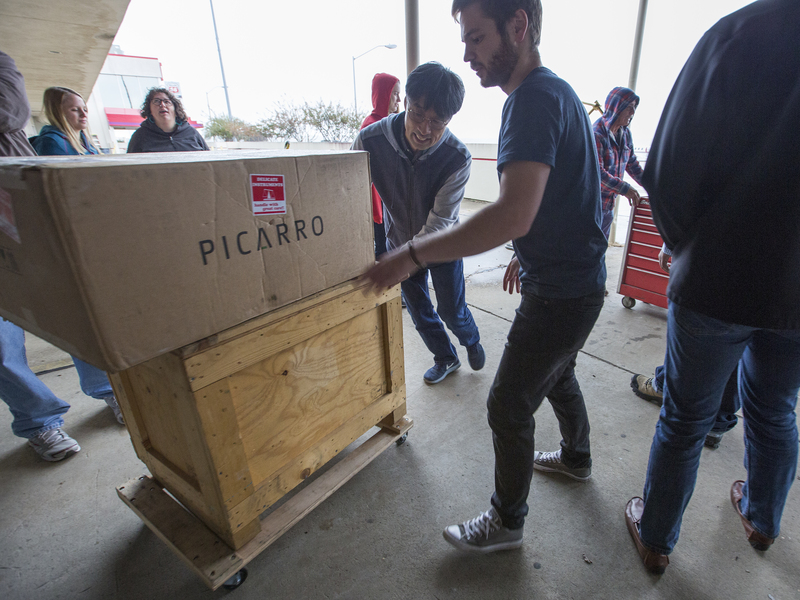 On Saturday, Nov. 4, we took a break from flying to do instrument work and maintenance. For my group, which is tasked with the Atmospheric Vertical Observations of CO2 in the Earth’s Troposphere, or AVOCET, in-situ measurements, that meant calibrating our instruments. When we calibrate, we send our instruments gases that have a known concentration and record what our instruments measure. Doing this regularly allows us to keep track and correct for the instrument drifting over time, and to maintain the accuracy and precision of our measurements. 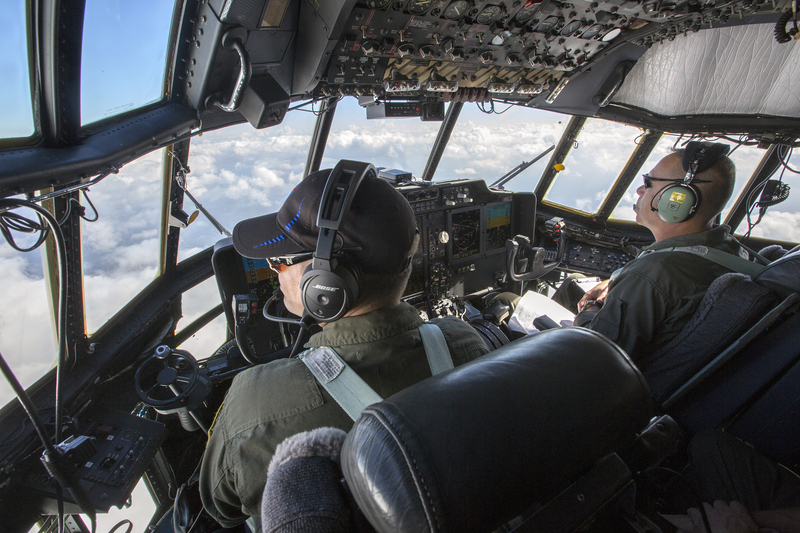 Our two aircraft, a C-130 and a B-200, are stored in different locations when we’re at our ground sites. 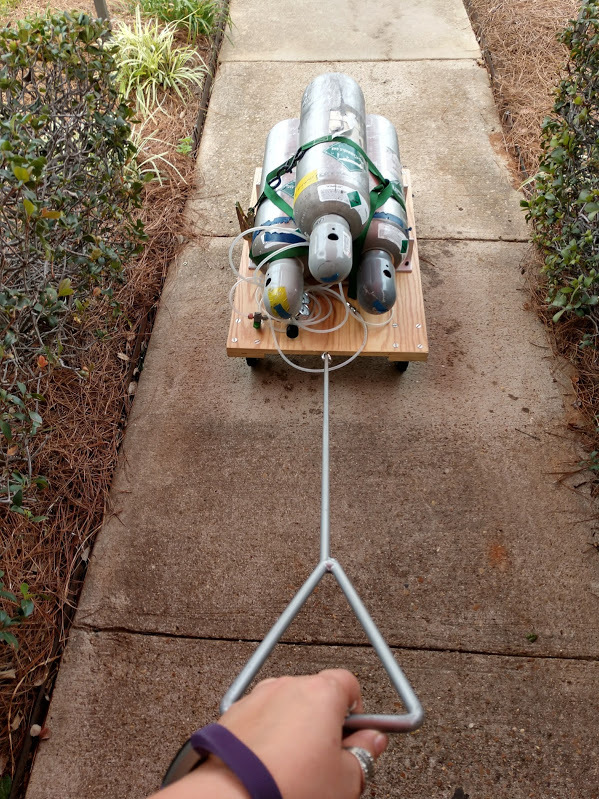 The calibration gas tanks are heavy, so for ease of use we’ve built our calibration gas cylinders their own little cart that they live on, which can be towed from one location to another. The cylinders are left on the cart, where we put a regulator on the calibration cylinder we want to use and run a tube into the airplane. It’s a simple solution that lets us easily and quickly use the same calibration gases on two different aircraft. One of the reasons I love working in science is that our measurements and our work is built on a heap of clever solutions to small problems. While we also stand on the shoulders of scientific giants who had deep insights into the workings of the universe (for instance, Isaac Newton realizing that the gravity affecting an apple also affects the stars), in our day-to-day work we use the cleverness of the people who worked out the universal swage fittings, or the person who figured out how to set up our inlet system to bring air in from outside the plane when we’re at high altitude. We’re not all brilliant all the time, but by looking at a problem long enough we can often find a clever solution to a small vexing problem (such as how to quickly transport our calibration cylinders), and that’s where our progress comes from. 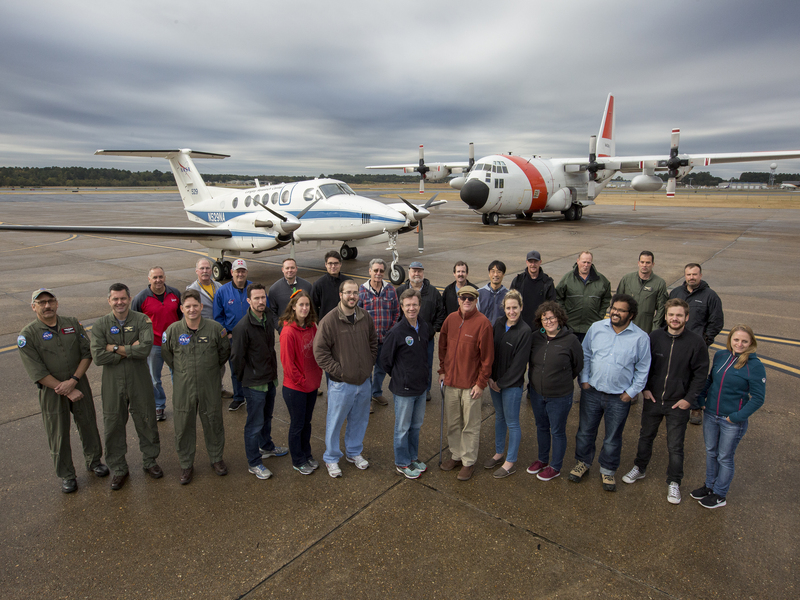 On Sunday, Nov. 5, we flew a science mission, measuring the inflow of air from the Gulf of Mexico. It was a busy day for me, because I was both tending my group’s instruments and also taking flask samples for NOAA. 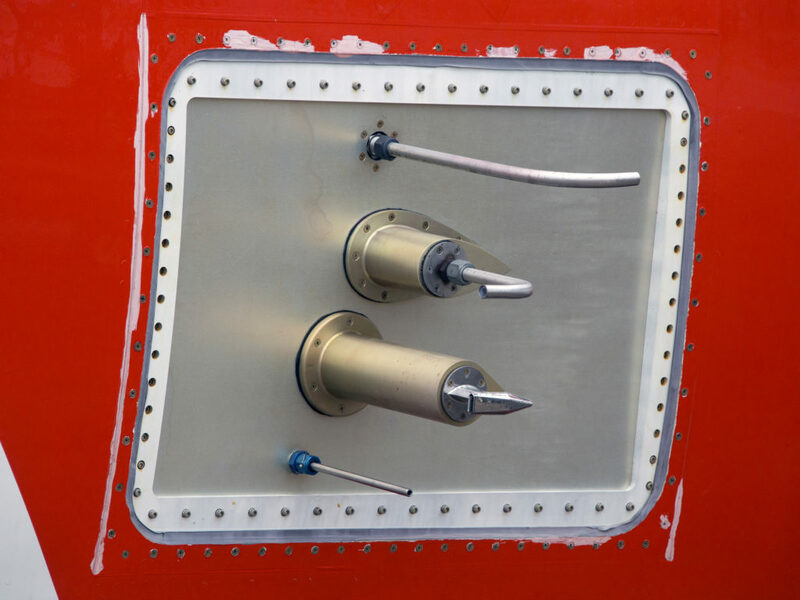 NOAA uses glass-lined containers to trap air at specific locations on the flight track. They take these samples back to their lab in Boulder, Colorado, where they measure the greenhouse gases as well as other molecules that help determine whether samples were influenced by other sources, such as traffic or wildfires. My job was to follow their sampling plan, telling their mostly automated system when to collect a sample and coordinating with our in-flight calibrations. The flights can be quite busy, and it’s a full day of activity. 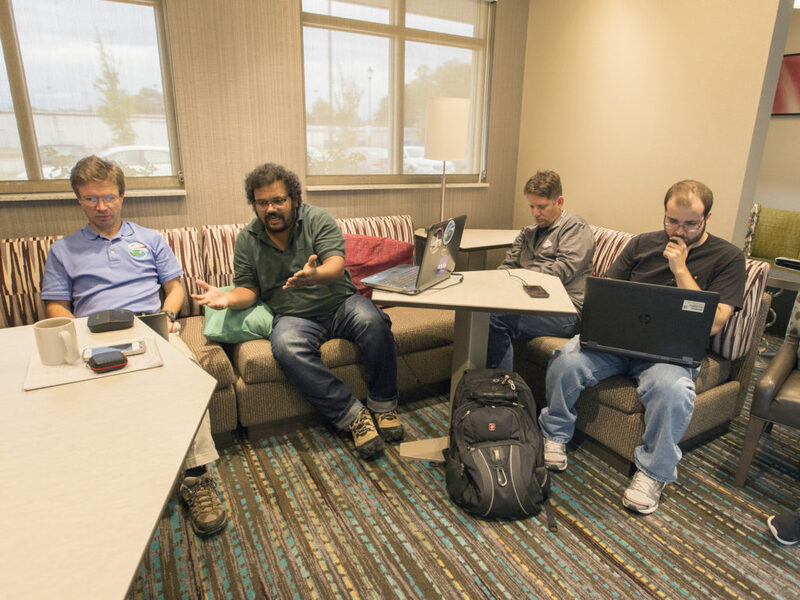 For the four to five hours that a typical science flight will last, we have an additional three hours of flight prep before we take off, and a debriefing meeting once we land, plus data workup and archiving the preliminary data once we’re back in our hotel rooms. It’s satisfying work, but it’s important that we have non-flight days like Saturday to catch up on our instrument maintenance as well as personal things—exercise, laundry, even sleep. 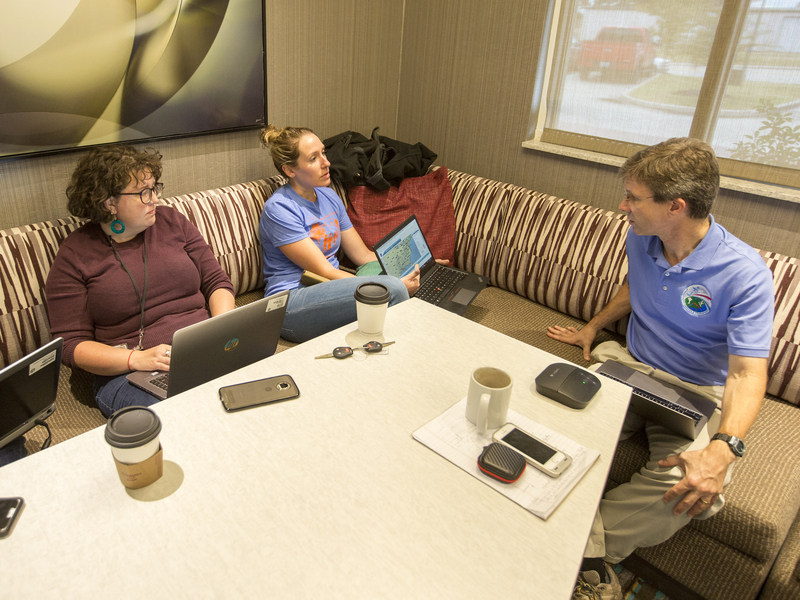 When we’re in the field there’s no set schedule like when we’re in the office, and it’s important to grab that time when we can, because flight days depend on the weather, and a good measurement day waits for no scientist, not even when they have a plane! I don’t know what I was expecting from Louisiana in late October, but I definitely wasn’t expecting cold and damp. I’m here for the final leg of the fall 2017 flight campaign for Atmospheric Carbon and Transport-America, or ACT-America, a five-year NASA study looking at the transport of carbon dioxide and methane by weather systems in the eastern United States. This is the third flight campaign of the study and the team has just arrived in Shreveport—home base for the next two weeks. Flight operations will be based out of Shreveport Regional Airport. Sleep operations are based at a hotel just a few minutes down the road in Bossier City. As I’ve already mentioned, the weather so far is pretty meh. There’s a slow-moving front to thank for that. But more on the creeping front later on. First, a little taste of ACT-America’s home for the next couple of weeks. Shreveport is the largest city in Ark-La-Tex, a region that includes Northwestern Louisiana, Northeastern Texas and South Arkansas. It and Bossier City are divided by the Red River. Shreveport is on the west, Bossier City the east. Casinos dot the riverbank—the Horseshoe, Boomtown, Eldorado, Margaritaville, Diamond Jack’s. It’s no big surprise that you can’t go far here without finding restaurants that have Cajun and Creole dishes on the menu. The first night in town, a contingent from the ACT-America team visits the Blind Tiger in downtown Shreveport. Steaming plates of crawfish etouffe come out of the kitchen accompanied by crusty homemade croutons and mounds of rice. There’s a dish called Cajun fried corn—breaded, deep-fried corn on the cob. Louisiana beers are on tap. Gumbo is spelled gumbeaux. The State Fair of Louisiana is taking place in Shreveport. It claims to be the largest livestock show and carnival in the state. Rick Rowe, a reporter with the local ABC affiliate, does a segment on the morning news with a man who sells fried cheese at the fair. Rowe samples a cube that’s just been pulled from the bubbling hot oil and sounds positively ecstatic as he bites through the crispy breading. The state fair isn’t the only thing going on, though. Another news segment has a meteorologist visiting a Bossier City shop that sells power equipment: lawnmowers, leaf blowers, generators, chainsaws. They have an event coming up called Sawdust Days. Folks who show up for Sawdust Days will be treated to a special demonstration by a man who does wood carvings with a chainsaw. I turn off the TV and head to the airport to catch up with another guy who knows something about meteorology—Ken Davis, principal investigator for ACT-America and a professor of meteorology at Penn State University. Weather is critical to ACT-America. 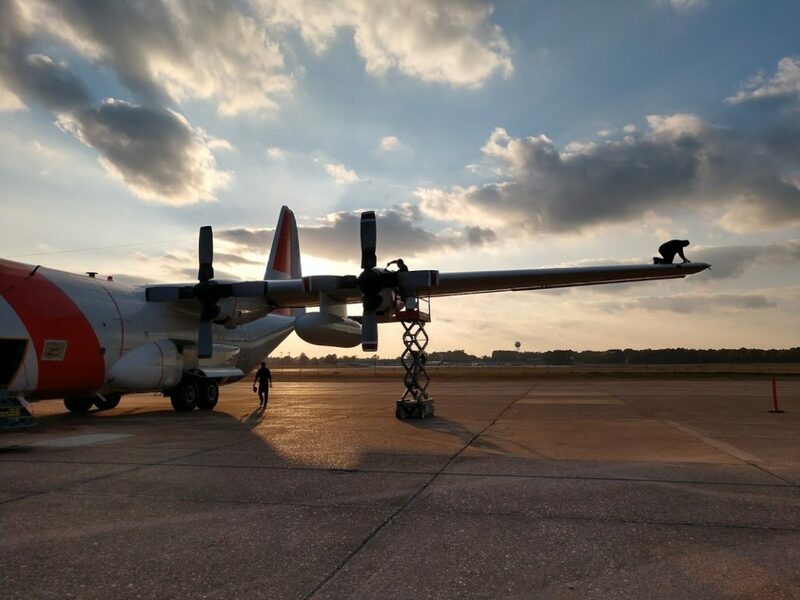 In fact, it’s the reason that, on its first full day in Shreveport, the campaign is keeping its C-130 and B200 aircraft on the ground. Just the day before, as ACT-America moved from its previous homebase in Lincoln, Nebraska, to Shreveport, the aircraft passed through the very front that’s inching through Louisiana now, bringing the chilly air and rain along with it. 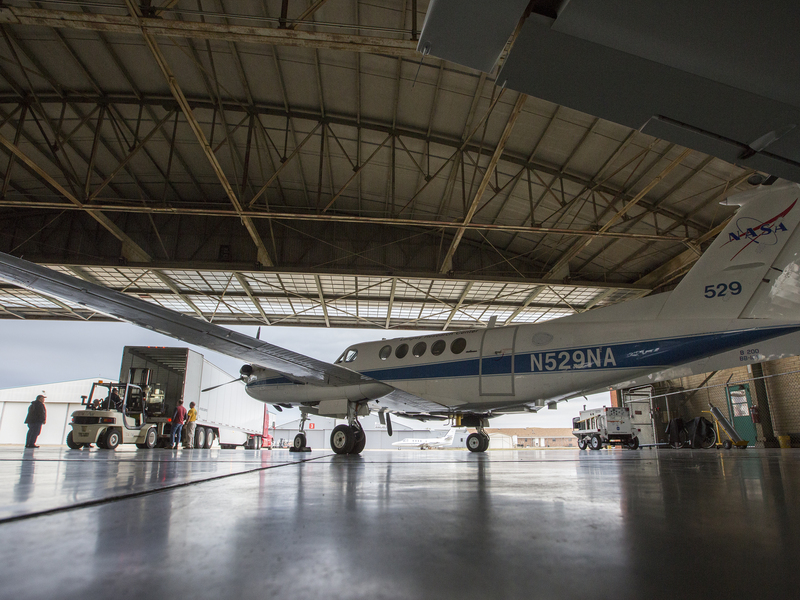 Instruments on both aircraft measured carbon dioxide and methane levels during the transit. 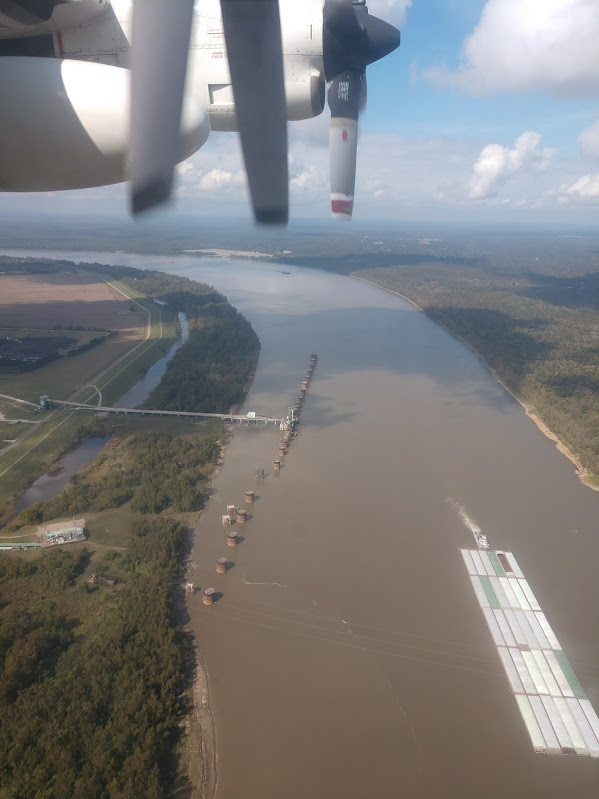 What the team will want to measure, though, is what happens to the greenhouse gases after the cold front stalls not too far south of Shreveport. There, it’ll get a push from warm, low-level air flowing in from the Gulf of Mexico and then move northeast as a warm front. It’s a scenario that may take a couple of days to play out, so the next research flights may happen tomorrow, they may happen the day after tomorrow. The atmosphere will do what it wants to do, thank you. Davis likens it to a big cup of coffee. Later on, at a planning meeting, they make the final decision—another down day tomorrow, then a flight the next day when the great big teaspoon in the sky has finally mixed things up just so. It’ll be a good day for airborne science. The meeting breaks up. Folks head back to their hotel rooms. With a free evening in front of me, I think about taking a chilly walk down the bank of the Red River to get a look at the Shreveport skyline at night. And for some reason, I’m craving a piping hot cup of coffee.